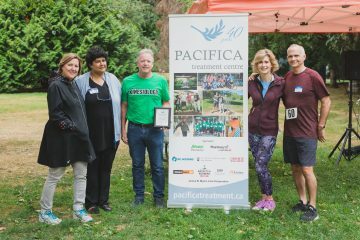 On Sunday, August 12, community members and participants from Pacifica’s Treatment Centre gathered at Trout Lake for the 1st Annual 5K Fun Run “Race for Recovery”. The School of Kinesiology participated as a partner in the event, which celebrated life, people, community, and the power of exercise in recovery from addiction. Exhilarated runners crossed the finish line to the cheers and support of family, friends, and volunteers. 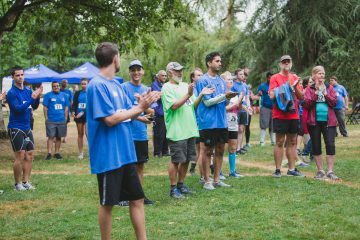 Following the 1 and 5km runs, a festive ceremony led by CTV News Vancouver anchor Coleen Christie brought numerous participants to the microphone all expounding the powerful effect of exercise on mental health and its key role in recovery. they belong in society, and that they are much more than their struggles with addiction. Seeing our alumni come back to participate in runs helps them to remain connected not only to recovery but to a healthy lifestyle.